IT Jam is a conference for developers in Ukraine. Highly popularized through the last years now it became the most popular IT events in Ukraine. The slogan of conference is “Meet & Mix” saying it’s primary goal is to create good conditions for networking and experience sharing. I’ve never been visiting IT Jam before. But this time, I not only visited but have a speech there. 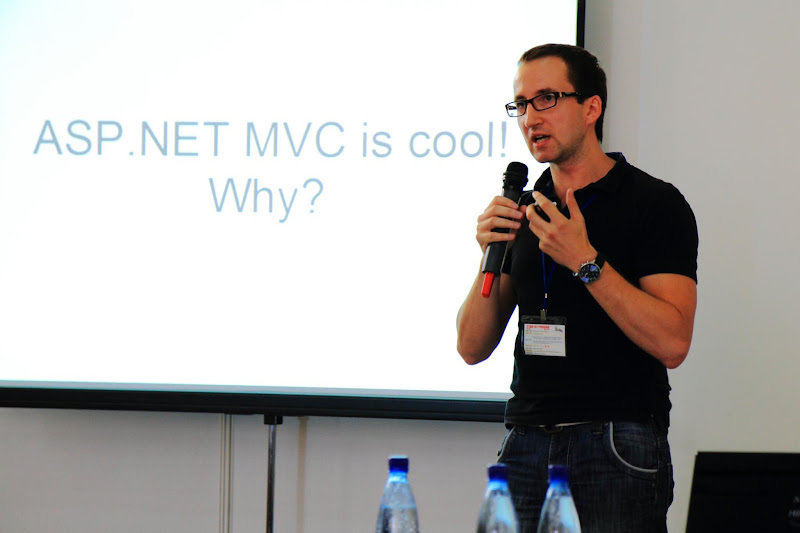 Moreover, the company I work to was sponsoring .NET section.. and I got a honor to be a representative there. I’ve started to prepare on a very short notice, just 5 days before conference.. all of these facts let me a little nervous. We decieded to go by car, with my great colleagues @korneliuk and @VladAlieks. Having a good company is a key for any trip. I haven’t noticed how fast we came to Odessa. We stopped in Odessa’s Alpine club where I used to spent great summer days during my rollerblading career. We’ve got there late evening, so had a time only to install our tent, say hello to the sea and fall asleep. Next morning we have a breakfast and moved to the place. IT Jam took biggest area in Odessa, Odessa’s See Terminal. That was really cool, since there you definitely could feel the spirit of Odessa - sea breeze, sun, ships. Marina Vyshegorodskikh and Alexandra Chudner who opened the event, energized the crowd for the rest of the day. I’ve spent most my time mostly in .NET section. IT Jam format of speeches are supposed to be short. That was something that I didn’t expect at the begining, so after the schedule been published I realized - it is just impossible to fit everything I want to say in such short period of time. Anyway, I had no option and have to start my speech. Olga Didich did a great job helping out all speakers and timekeeping. So, I just step by on scene and started up. As always it’s quite hard to describe and show the code for such big crowd, but I tried the best. Of cause, I haven’t managed to accomplish all my speech.. but I was really happy that people were contacting me a lot of questions, just after it. We were sitting together with one guy after and I was showing the rest of my presentation just for him :). As “Meet & Mix” format supposed, I had really nice talks with other developers. Ones, that I worked many years ago.. or ones we’ve met just recently.. or one’s we following each other in tweeter but had no chance to meet offline :). So, @dimapasko, @ChuniMuni, @xpinjection, @chaliy, @antonvidishchev, Dmitry Davydov - guys, it very nice to see you there.. Thanks for your company and great beer-n-talks we had together. At the evening I’ve met my old friends from Odessa and all our company moved back to Alpine club, to have a swim, drink and guitar playing on beach for all night. That was just amazing conclusion of that day. I want to say big thanks, for everyone who involved in organization. Keep doing great job and improve from year to year. And for my friends who were always nearby, supported me and didn’t allow to be bored.